A few days ago we celebrated the feast of Our Lady of Fatima. One of the many messages Mary gave to the visionaries was the Oh My Jesus Prayer that we say at the end of each decade of the rosary. I decided to incorporate this apparition and prayer into our homeschooling for the day, since this is one prayer that my children do not know. 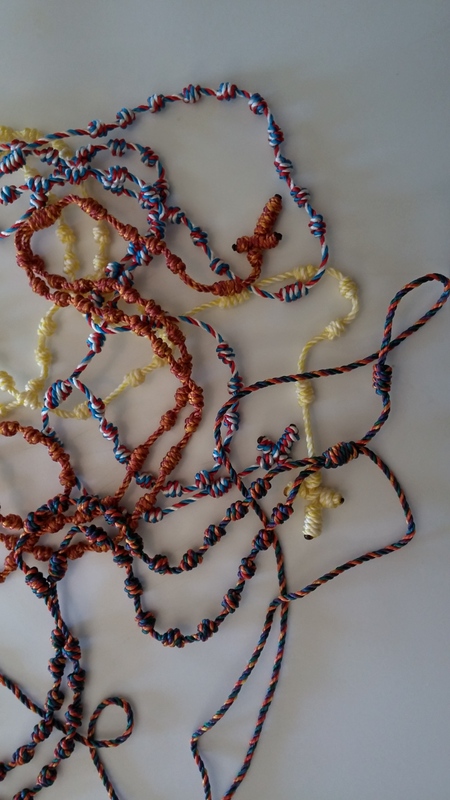 One of the things I learned how to do in college on a retreat was make the rope or cord rosaries. I absolutely love to make these, even today. I actually have a bunch of rope in my house left over from college, different groups, and a project I did for a retreat my mom was leading. One of the things that I love about these rosaries is that they are pretty darn indestructible. This means that they are perfect for my kids to learn on. I dug into my bag of cord and of course, only found one. But, with so much extra cord, I figured I would just make one for John. While Rosie was excited to receive hers, John was ecstatic that I would actually be making one. These rosaries do not take a whole lot of time, only 20-30 minutes. I think that I am going to try to make one rosary a day. When you think about it, that’s not a long time, especially when I stop to think about how much time I spend on my phone. Rather than a few seconds checking Facebook, I can make two or three more beads. Interesting fact about making rosaries. They leave their mark. I am currently sporting a nice blister on my right index finger. It got me thinking about how the activities we do impact our bodies. A runner’s body will be different from a football player’s. A person who works at a computer desk for a living will have different points of stress than a construction worker. I didn’t realize just how much our bones can tell about us until I started watching the TV series, Bones. Dr. Temperance Brennan is a forensic anthropologist who solves murders by examining the victim’s remains, specifically their bones. Yes, it sounds rather morbid but it is a fascinating show. She is able to tell by only studying a person’s bones key things about their life. A runner will have specific wearing on in their knees and hips. A person who carried heavy loads often will have certain vertebrae pinched. A mother with small children will often have a twist in her back from carrying a child on her hip. Someone who has recently been in a fight will have bone remodeling on their knuckles and can even tell how long ago the fight way based on how extensive the remodeling was. It’s amazing and it’s all science! It makes me wonder what my body would tell someone like her. What would I be proud of? What would I not be so proud of? Over the course of our life, many many things shape who we are. How many hours have I sat on my rear end watching TV? How many hours have I spent on my knees in prayer? How many times I have bent down to pick up toys? How many nights have I paced with sleepy babies, bruising my shins on dressers and cribs or tripping over stray toys? Our bodies tell our stories, our battle scars leave trails of triumph and defeat. I hope that each of us can be proud of the story our body tells at the end of our life. 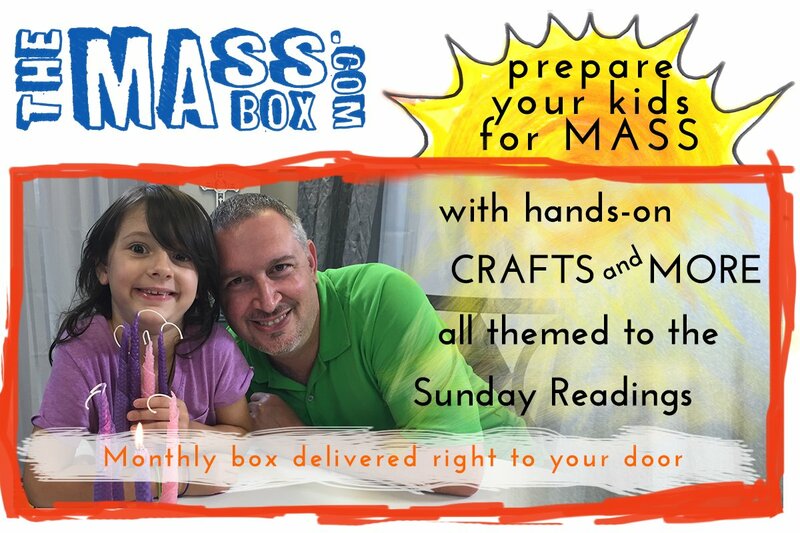 I’m so glad I didn’t have two rosaries to give the kids. What a grace I received by making just one.